These AquaticLife™ T5 HO fixtures offer 420/460 nm, 700+ nm and Lunar light in one streamlined unit. * Timer controls T5 HO Fluorescent Lamps and Lunar LED’s independently. * Adjustable width Aquarium Frame Mounts support fixture above the aquarium. * German-made specially angled reflector maximizes light by directing it into the aquarium. * Suspension Ports allow connection to optional cables for various mounting configurations. We’ve been working hard to produce a protein skimmer that will not only work in the aquarium, but in the pocketbook as well! Handcrafted protein skimmers assembled with top quality extruded acrylic tube that is mechanically bonded to Heavy Duty PVC Type 1 sheet material. The same construction used on our top-of-the-line CS & RC series protein skimmers. Using proven EcoPlus pumps from Sunlight Supply, these skimmers are incredibly powerful and compact as well as efficient and AFFORDABLE! Available in eight models handling aquarium systems of up to 1000 gallons, there is a VS skimmer that will provide you with the kind of performance and value you demand from a Protein Skimmer for YOUR aquarium system. The VS Series skimmer utilize all the trademark Euro-Reef components including the PIN-WHEEL impeller, hand machined Venturis, Euro-Loc quick disconnect, Euro-Reef engineered turbulence reducing Transition, and easy to use outlet assemblies. ALL HAND MADE IN THE USA!! The price is right, the performance is awesome and the name is…EURO-REEF! 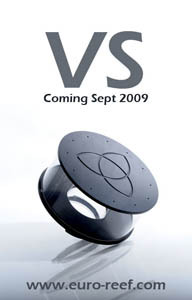 The VS Series will be available in stores and online starting Sept 1st, 2009. Pre-order your TODAY! !